The Landscape Group is the leading landscape construction and maintenance contractor in the UK. 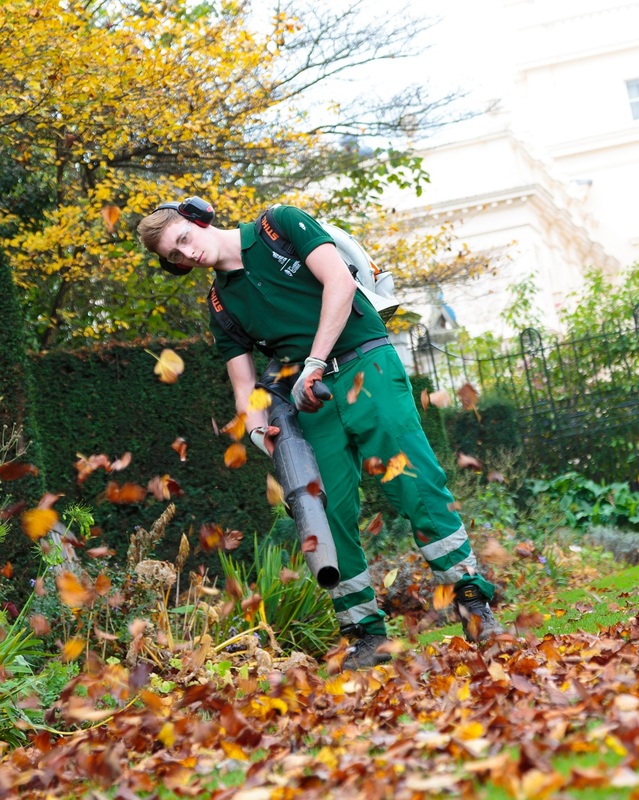 Here, apprentice Charlie Blackmore works in Regents Park. Image is property of TLG and Strobix Photography. The Landscape Group will support The Parks Alliance by providing business support, through a newly announced arrangement. The Parks Alliance (TPA) is the voice of UK parks, representing the people and organisations that create, maintain, invest in and use the public green spaces at the heart of British life. The Landscape Group, established in 1919, is one of the largest and longest established green service specialists in the UK. The company offers a quality service in park management, grounds maintenance, tree surgery, street cleaning and landscape construction. Rob Pearce, TLG Business Manager in the Strategic Parks team, will provide business and membership services and offerings for the Alliance and develop the fundraising element of the Alliance, among other matters. Rob has recently joined TLG, coming from a background of social enterprise management at Cofely UK and the Social Enterprise Renaisi. He has lectured on Social Enterprise and Regeneration at UCL, Kings College London and at Politecnico di Milano University in Milan, Italy. Sarah Hughes-Clarke, Business Development Director at TLG and TPA interim board member, says the relationship aligns interests as TLG’s core business is reliant on investment in park services. “It’s difficult to attract good people into jobs as park or greenspace managers. Raising the profile of parks and those that work within them should encourage great candidates to come and work in parks. Also, if green spaces are valued by decision makers in government, the greater and more sustainable is the green space market. Properly resourced parks and open spaces are not just ‘nice to have’, they have been proven to improve the local economy in terms of attracting visitors and businesses, raising land values and contributing to the environmental sustainability and the health and wellbeing of our communities. “TPA is a young organisation growing quickly, and TLG’s business services will enable TPA to move to the next level. TLG will provide TPA with business management services through the secondment of a Business Manager and access to advice from other TLG business specialists. Mark Camley, Chair of The Parks Alliance and Executive Director for Park and Venues at the Queen Elizabeth Olympic Park, says the partnership with TLG will help the Alliance deliver its agenda of promoting and protecting public parks. “Entering in to a partnership with The Landscape Group will provide TPA with dedicated support to help us organise and campaign more effectively. It also signals that TPA is not just about the traditional local authority element of the Parks sector, but that it embraces “contractors” as well. The problems we face apply to private and public sector. “TLG will help in developing our business model, bringing a level of commercial acumen to our thinking. I hope that it will also encourage other businesses to think about how they can support TPA. The Parks Alliance is the voice of UK parks, representing the people and organisations that create, maintain, invest in and use the public green spaces that we are proud to have at the heart of British life. Its objective is to promote and protect the public parks we are proud to have at the heart of UK life and culture. The UK-wide Alliance includes 40 organisations and senior park industry figures from local government parks services, private contractors, industry bodies, NGOs and volunteer and park friends groups. Full biography: Rob Pearce, Business Manager in the Strategic Parks team at The Landscape Group. Rob Recently joined The Landscape Group where he is the Business Manager in the Strategic Parks team. Prior to joining TLG Rob was Social Enterprise Manager at Cofely UK a leading service business in the UK across public, private and healthcare sectors and part of the GDF SUEZ Group. There Rob set up and ran new joint venture social enterprise on the Queen Elizabeth Olympic Park aimed at delivering the regeneration legacy of the games for local communities through Cofely’s long term energy and services contracts on the Park. He was a Director at leading Social Enterprise Renaisi between 2007 and 2013 covering local economic development, community engagement and social investment and remains a non-executive Director of the Company. Prior to joining Renaisi he worked in local government as Assistant Chief Executive covering regeneration and planning and for a national government agency where he led large scale improvement programmes in local authorities. He is a qualified accountant and has an MA in Cities, Culture and Social Change from Kings College London. He has lectured on Social Enterprise and Regeneration at UCL, Kings College London and at Politecnico di Milano University in Milan, Italy. State of UK Parks: Renaissance to risk?